We’re leveraging decentralized tools to build the next-generation of financial products. We envision a future where people don’t have to think about wallets, identity, tokens, or exchanges. We want to build a seamless experience where value flows freely and securely. For the first time in history, we have a technology that enables us to build a globally inclusive, frictionless, and peer-to-peer financial system: one that enables us to trade value directly with each other, all while having full custody of our assets and money. By harnessing this new technology and building the right tools, we can create markets that are more transparent, inclusive, efficient and user-centric. To get there, we need to build a decentralized, next-generation financial stack. We built a team around this vision and we are determined to be at the forefront of building secure, user-centric products that empowers people to preserve their wealth, trade seamlessly, and do commerce globally at low cost. We believe that the future economy will be increasingly tokenized, so we’re starting off by building products to drive adoption of cryptocurrencies. Our team has been busy building a new decentralized trading platform which focuses on delivering a better user experience. Built on the 0x protocol with immediate shared liquidity, Lake Trade is designed to be easy to use with a minimal learning curve. Lake Trade will act as a base layer for our future products, bringing more people to this new asset class as the technology in the space matures. 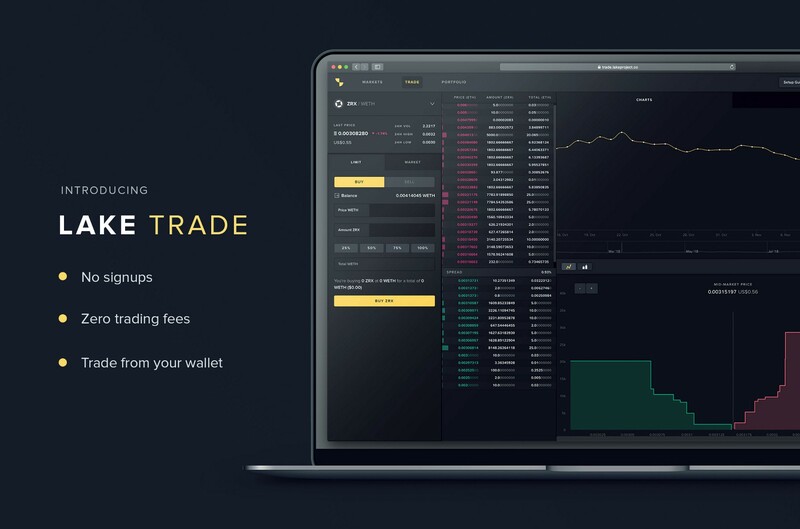 Visit https://trade.lakeproject.co to try out our zero-fee decentralized trading platform! Co-founded by Will Warren and Amir Bandeali, the talented team at 0x figured out how to leverage the Ethereum blockchain to power decentralized trading, laying down the infrastructure for the next generation of asset trading. Their vision goes beyond the exchange of crypto assets and aims to affect the facilitation of all assets digitally. As the leading open trading protocol, 0x’s vision isn’t simply about trading the currently available cryptocurrencies, but rather to focus on building a protocol that enables market makers to facilitate all kinds of trades, from unique tokens(non-fungible tokens), to other digitized assets, to securities. As part of the 0x network, the Lake Project benefits from shared liquidity with other market makers on the network. This gives us immediate liquidity through a shared order book, incentivizing participants to collaborate in a beneficial manner as liquidity increases and adoption grows. 0x protocol has introduced a few different order matching methods to which helps mitigate insider trading and frontrunners to ensure the fair settlement of orders, resulting in a better user experience. At the Lake Project, we share this ambitious vision for a global, seamless, inclusive and tokenized economy. The progress 0x has already made on their protocol to abstract away the complexities of working with blockchains and cryptocurrencies made adopting the protocol a natural fit. We believe that decentralized protocols will power the future of commerce, but they’re also not a perfect solution. Technology provides the tools to solve problems and at the Lake Project we intend to leverage the right tools for the biggest problems. We envision a future where you have a single, seamless application to send payments, trade and invest, do commerce, and use dApps. For the novice trader, using a decentralized trading platform is still a complicated and challenging experience. Users must have an understanding of the concepts of wrapping and unwrapping Ethereum tokens, what the ERC20 standards are, and how to set up and connect your Metamask wallet. We believe these challenges will be solved quickly, and we want to do our part in championing a better user experience by shifting the focus on the user experience for traders and not on the technology itself. Good design is not about how it looks, but how it works. Good design is a core principle of the Lake Project. A product is fundamentally not about the technology but rather about empowering people to accomplish their goals and solving their problems in the easiest way possible. A decentralized trading platform is no different. We listen intently to our users and traders to build the most seamless experience. Lake Trade gives you a high level overview of your asset allocation in your wallet. As traders ourselves, we understand that there’s a strong demand for a way to manage and track portfolios. What better way to build these than to integrate them directly into our platform? 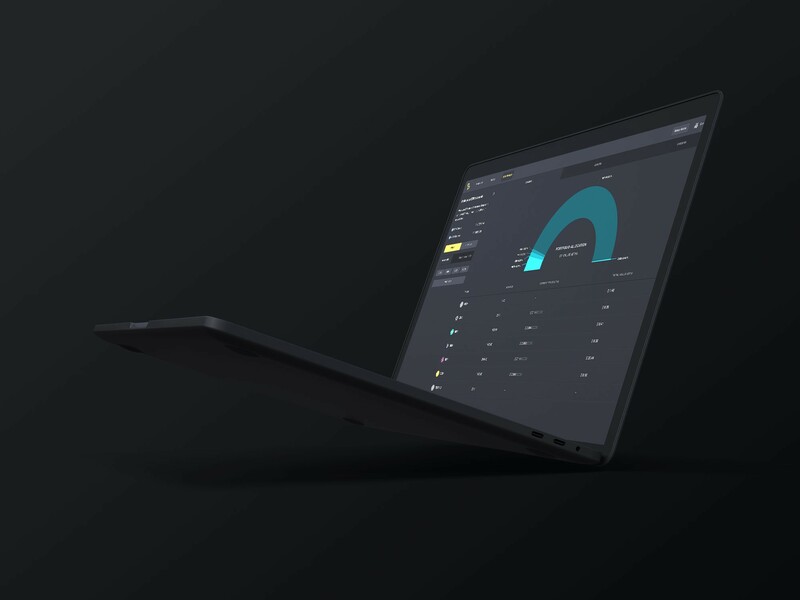 In the coming months, Lake Project will exploring solutions around the trading experience to help traders get a handle on their portfolios, tax compliance, market insights and more. Interested in giving us your feedback? Join our Discord or Telegram and share your thoughts with us! While decentralized trading may be the future, they’re currently limited in liquidity and selection of assets. We believe that it’s advantageous to build a hybrid trading experience where we can pass on the advantages of both centralized and decentralized trading platforms to traders, for the ultimate trading experience. Investing reimagined with our Hydra AI. Our goal of realizing the full potential that new breakthrough technologies allow is not a matter of merely adopting traditional means and porting it over to new technology. But rather, getting back to first principles to understand how this new technology can create a brand new experience, one that leapfrogs the traditional way of doing things. We’ve now reached a stage where AI and blockchain technology have matured enough to create this leapfrog experience, and the Lake Project’s core product — Hydra AI — is the result of this technological advance. A cutting-edge artificial intelligence, Hydra AI can automatically build a portfolio of assets, and continuously diversify and re-balance to maximize returns. This is something that was previously not possible without blockchain technology and the latest advancements in evolutionary strategies in AI. By combining the two, we’ve redefined the paradigm of investing. Investing can be a fully automated experience, without human intervention, available to everyone, not just hedge funds or large institutions. Our intention is to weave this experience throughout our trading products and open up the power of Hydra AI to the world through the Lake Project. While the industry is still in a nascent state, it moves fast and operates in a hyper-timescale. In the past year alone there’s been prolific development across the industry tackling everything from scalability and privacy to social good and financial inclusion. Decentralized protocols open up new opportunities to facilitate commerce — not just for crypto assets — but any kind of asset. Whether it’s stocks, bonds, or unique tokens (e.g. crypto-kitties), the Lake Project is building an ecosystem capable of facilitating all trade. Innovation is happening at an incredible pace, and every day we are getting closer to realizing the full potential of blockchain technology. A future where financial inclusion and access becomes commonplace for all. A future where people have more control over their money, data, and privacy, and one where nation-states and corporations become more transparent, accountable, and efficient. As the technology matures and new opportunities open up, the Lake Project will continue to build products to enable a new open financial system. We believe the real promise of decentralized protocols is empowering this new open, global, and inclusive financial system of the future tokenized economy.